Indiana might be known for its tenderloin, hot dogs, and antiques, but she is also well known for her local hand-crafted beer! From Indianapolis to Kokomo, you’ll find some of the coolest breweries around right here in Indiana. Check out our 10 favorites! The Tin Man Brewery has been open in Evansville since 2012 and already has quite the fan club. Owners Nick and Sara Davidson, opened the restaurant in the historic downtown Evansville area, in the newly renovated train depot. What makes Tin Man Brewery different from other breweries is the set up. Long community tables set just so that customers have to sit next to one another, whether they know each other or not and be able to talk to one another. Like some breweries, there is no grill or deep fryer in the taproom. Although, you can bring in food from other establishments and order one of the Tin Man’s best to go along with it. Not sure what to get? Ask your friendly bartender for recommendations! The Tin Man is also kid friendly and pet friendly, so if you ever find yourself passing through Evansville, be sure to bring the whole family to the Tin Man! Another great local place for good food and good beer is the Half Moon Restaurant and Brewery in Kokomo, Indiana. It was Kokomo’s first and only brewpub in the beginning, and prides itself on making great, fresh tasting beer. Everything is made by hand at Half Moon, including the food. No artificial ingredients or preservatives to be found here! Portion sizes are quite healthy and the prices are exceptional too. Not sure what to get? Try the Half Moon beer sampler, in addition to a hot fudge brownie sundae or Jamaican Jerk Chicken! Probably one of Indiana’s more unique breweries is Books and Brews in Indianapolis. Not only do they make their own handcrafted beer at a reasonable price, they also operate a used bookstore within the brewery. Like the bookstore in Anderson at Mounds Mall, Books and Brews also donates 10 percent of their proceeds from all book sales to Indy Reads, dedicated to improving the literacy rate in Indiana. And if you look closely at the name of their brews (which really are reasonable priced), you’ll see they are named after some of the most famous characters in books: The Hound, Nancy Brew and the Hoppy Boys, Clifford the Big Red Ale, One Fish. Two Fish. Red Fish. Brew Fish. Be sure to check them out if you are ever passing through Indianapolis! If you ever happen to find yourself in Whiting, Indiana, make a stop at the Bulldog Brewing Company. Raising their pints to neighbors and cherishing small town American values, Bulldog is the place to celebrate the blue-collar workers thanks to owner Kevin Clark. The atmosphere is relaxed and laid back, perfect for the whole family. The Bulldog also has live entertainment and theme nights such as 80s Night. Ask your bartender for the best drink specials and try one of their weekday specials! For all the wing fans out there, Tuesdays are 75-cent wing night (dine in only). Located in the heart of the historic downtown Lafayette district and just minutes from Purdue University, Lafayette Brewing Company is the place to be for students and families alike. For the 21 and older crowd, there is a bar and banquet area on the second floor. They are the second oldest operating brewery in the state of Indiana. Lafayette Brewing Company features locally produced, quality ingredients when creating and crafting their beers, and believe in supporting the Lafayette Community at various events across the city. The company also has an excellent assortment of food to go along with their hand-crafted beers, and you can even take the beers to go! The Sun King Brewery in Indianapolis opened their doors in July 2009, making them the first “full scale” production brewery since 1948. Take a tour of the tasting room (only those 21 and older allowed with proper ID of course) and sample the house, seasonal and specialty beers. The atmosphere is friendly and welcoming, and the staff is most amazing. Did you know you could buy a keg of beer from Sun King? Order a keg of your favorite beer during Tasting Room hours! Just outside of South Bend in Granger, Indiana, Bare Hands Brewery first opened in December 2011. Owner Chris Gerard had one mission: to handcraft incredible beer with the highest quality ingredients. All crafting is done on sight, and has developed a following along the local beer lovers. Their beer is also distributed to select bars and restaurants throughout Indiana. When visiting Bare Hands Brew, be sure to try the bacon turkey panini or the grilled cheese with your choice of brew! 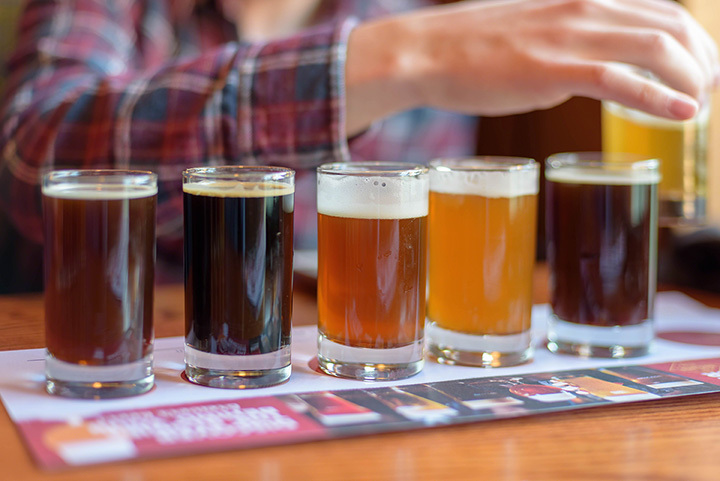 The 18th Street Brewery is the second largest operating brewery in northwest Indiana and has two locations: Hammond, Indiana and Gary, Indiana. The location in Gary is the original location and offers draft and packaged beers, as well as cocktails. Much like The Tin Man Brewery, customers can order from the restaurant next door or bring in their own meals. The Hammond location has a taproom and kitchen and is the home of their production facility. Both locations have a non-smoking and non-vaping policy. Want to bring your furry friend along? The Hammond location has a dog friendly patio section. Everything in the taproom at both locations is handmade and absolutely delicious. Located on the Courthouse Square in downtown Valparaiso, this brewpub operates under the philosophy of “Life is short, and one never knows how long each of us has. If we wait too long to pursue our dreams, we may never the opportunity to do so.” Their mission is to enjoy life and bring that same enjoyment to their hand-crafted beers and outstanding customer service. In business since 2010, this establishment is family friendly and offers a variety of food and beer. Try the Southwestern chicken salad or the Foothills root beer float, a most delicious and delectable drink with locally made vanilla ice cream. Located in Columbus, Indiana, ZwanzigZ Pizza and Brewery is a beer and pizza lovers’ dream place to be! What could be better than beer and pizza, all in one place? The ZwanzigZ offers over 10 varieties of specialty pizzas made with the finest ingredients for the freshest pizza, in addition to over 20 varieties of hand-crafted beer and soda, made on site. You can also build your own pizza, order an 8inch hoagie, or have a delicious calzone. Be sure to ask about what’s on tap for the day, or choose from one of their many beers such as the 525 Nut Brown Ale, Polished Hippie Porter, or the Ghost Pepper Imperial Stout. View more Indiana Breweries and Brew Pubs.